The 2011 Florida Annual Conference got its first look at the much-anticipated work of Bishop Timothy Whitaker’s Strategic Leadership Team (SLT) and gave its approval to the direction of the team so far. Conference Connectional Ministries Director Beth Fogle-Miller, who serves as staff liaison to the SLT, began her report to the Conference on a cautionary note: Last year was the first since 1946 when more people moved out of Florida than moved in. “We should not assume that things are growing as they did before,” she said. Fogle-Miller said that irrelevance and ineffectiveness are “not acceptable moral alternatives” for the Conference. The SLT was approved in 2010 and empowered to “clarify the vision of the Annual Conference, ensure the Annual Conference’s vision is accomplished, and oversee the alignment of all Annual Conference resources and ministries with the vision.” The team has been meeting since last fall, and hired a consultant to conduct more than 80 interviews with Conference staff, clergy and laity across the state. No sense of purpose for the Conference. Unresponsiveness from the Conference to the churches and from the churches to the communities. Ineffectiveness in addressing the diversity of the State of Florida. A diminished sense of connection. “The feedback was very, very clear and confirmed what we intuitively knew,” Fogle-Miller said. Connect congregations and resources for ministries that we do better together. Fogle-Miller allowed the members of the Conference to discuss those statements briefly. Shortly afterward, she asked for a vote on whether the members approved the work of the Strategic Leadership Team. The motion passed easily. Prior to the meeting, Fogle-Miller said the team’s work is unprecedented in the Florida Conference. Fogle-Miller also said there are encouraging signs of churches putting these principles into practice. “We’ve got some places around the Conference that are embodying this (the SLT proposal) already, and that are signs of hope and change. We’ve got some churches doing really neat things. They’re taking very seriously what it means to transform the world beginning in their own neighborhood. This fall, the SLT will launch an in depth look at all the Conference departments, starting with New Church Development and the Office of Congregational Excellence. “We’ll move our way through Connectional Ministries, looking at how the individual parts functions in relation to the other. Our long term habit has been to start departments without thinking through how they integrate and dovetail with the other parts. And we’re surprised when, years later, groups are operating very autonomously – when that’s what we asked of them,” Fogle-Miller said. In addition to Whitaker and Fogle-Miller, SLT members include Arlinda Burks, the Rev. Bob Bushong, Russ Graves, Gretchen Hastings, the Rev. Rini Hernandez, Beth Knowles, Dale Locke, Chuck Mallue, the Rev. 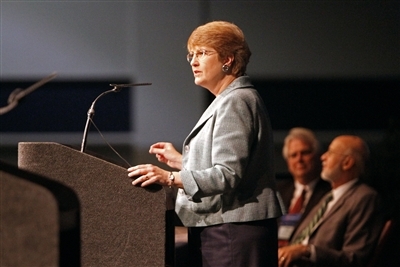 Annette Pendergrass, the Rev. Jeff Stiggins and Alice Williams.